PRESEZZI GROUP successfully start up in a record time the new front loading 18MN Press and Log heating system in CUPRUM Monterrey division. This is the press number 3 of 6 presses that have been awarded to PRESEZZI. The new investment, focused in particular in architectonic field, has as center piece a 18MN 7” PRESEZZI and a COIM high efficiency log furnace. Press 4 and 5, that will be delivered respectively during December 2016 and during June 2017, will have a 28MN front loading press 8/9” and a high efficiency COIM furnace, and they will be focused in the industrial and automotive market. After so strong collaboration and technological partnership, CUPRUM decided to award PRESEZZI GROUP with the last project that involve a complete extrusion line for light profiles with extremely high tolerances. 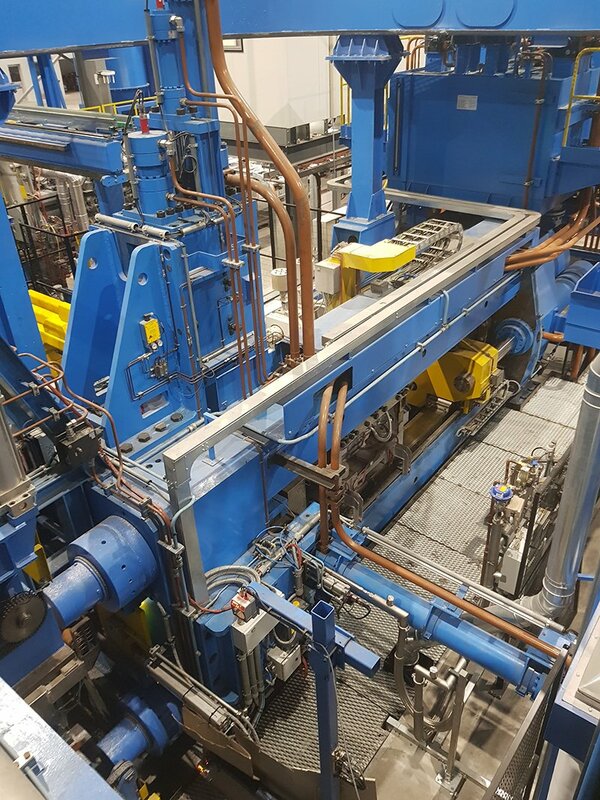 The new line will have as a centerpiece a 14MN front loading press 5/6”, a high efficiency COIM furnace and a complete handling system manufactured by PA Profile Automation (PRESEZZI’s handling and packing division). CUPRUM SA de CV is the largest extrusion manufacturer in Mexico and in all Latin America. The company, originally born in 1948 with a small press dedicated to the extrusion of copper became sooner the biggest and most known aluminum extrusion manufacturer in all Latin America. On ’90 two big acquisitions (Tiendas Alutodo and Alcomex) determinate the big step for CUPRUM on the Mexican market of aluminum profiles for architectonic, ladders and industrial business. 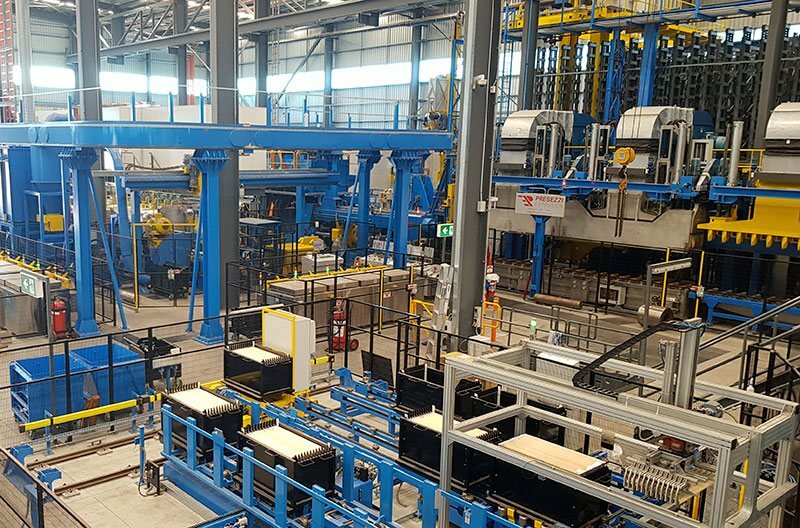 The CUPRUM Group that include more than 4000 employees, has three extrusion divisions, located in Monterrey, Mexico City and Guadalajara with a total of 15 presses and by the end of 2017 will have 18 presses in full production. On 2011 after the acquisition of Aluminio Conesa in Guadalajara, CUPRUM decided immediately to invest in the replacement of an old press, maintaining the original furnace and handling system. PRESEZZI team, after a careful review, proposed to supply a 20MN compact model and also a Presezzi log furnace with hot shear, in order to increase the productivity, and reduce the scrap. On 2014, due the increasing demand of extruded profiles in particular for the growing automotive market, CUPRUM decided to invest in a dedicated new state of the art line. After a carefully long review, CUPRUM team decided to award PE GROUP for the delivery of a PRESEZZI 28MN 8/9” (3150UST) front loading press and a COIM log furnace with hot saw. The press can develop a specific pressure of 118,000PSI with a billet of 8” and 93,000PSI with a billet of 9”. 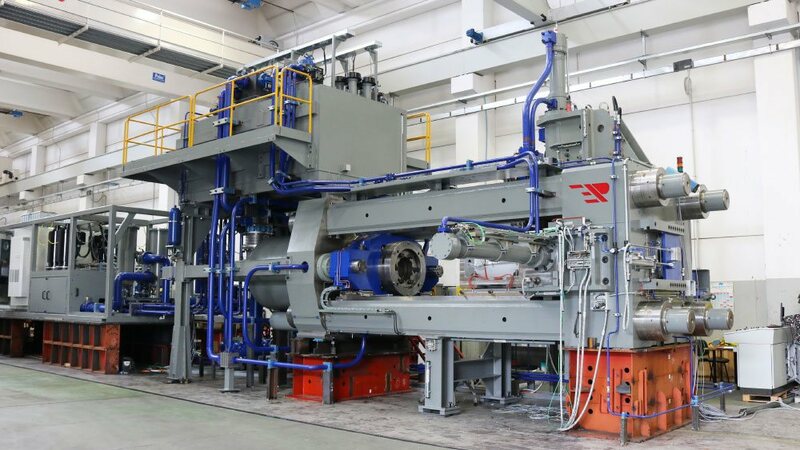 The high specific pressure was required in particular for the high extrusion ratios, and the ability to extrude hard 6XXX alloys and low 7XXX, typical alloys for the automotive field. The length of the billet that can be loaded into the press is 48” (1200mm). The dead cycle time with the longest billet is 14.5 sec. (including the burp cycle). With the advantage of the front loading that reduce the dead cycle time proportionally with the reduce of the length of the billet (a billet of 40” will have a dead cycle time of approximately 12sec.). The Energy Saving System with only four main pumps that brings the advantage to save energy but at the same time reduce the number of other components since no auxiliary, container sealing and pilot pumps are used. The Isothermal system that allow to have a better control of the temperature of the profile at the exit of the press guarantying the mechanical properties along the profile meanwhile the productivity is boosted at the maximum levels. The Protection at the exit of the press with the incorporated camera. Presezzi few years ago introduced as an option the possibility to have in all presses, an anti-blast door at the exit of the front platen in order to give to all customers the possibility to avoid accidents to the operators that are used to look into the front platen opening. Mounted on the 2” special steel door, there is a high-resolution camera that allow to record the critical break trough of the profile trough the die. The video can be used by the die shop team, to review and adjust the die properly. The Data Manager software packaged, a dedicated software that allow to send and receive all the proper production receipts to all the equipment, including upstream and downstream area. The Die Nitrogen cooling system, a special automatic device that connect the liquid nitrogen to the die. This system is a “must” when the high die face pressure and high extrusion speed are applying to complicate shapes and in particular in high yield alloys like 6082 or low 7XXX. The furnace design is capable to heat logs of 8’ and 9” with a production of up to 8400lb/h. The line includes a special system to reject the bent logs and a high performance HOT SAW. The linearity control was a special request form CUPRUM due the fact that bent logs are sometime loaded in the system causing damages to the equipment and stops of the production. The system consists in a multi laser checking system that control the linearity of the logs as soon the log is transferred from the log table to the pushing line. At this point if the system detects a bent log, a reject cycle is activated moving the log into a separate log table for reject log. The COIM furnace was chosen for the robust construction, the long warranties and the highest efficiency. The furnace is able to guarantee an homogeneous temperature of the log from the skin to the core of the log and a constant temperature billet after billet. An Hot Log saw was chose for the advantage to have a clean flat cut that can help to reduce the quantity of air entrapped into the container and avoid blisters. The tapered heating option, integrated in all COIM furnaces, is able to guarantee a tapered heating of the billet with a difference from the head to the tail up to 80F in a billet of 48”. With the furnace tapered heating option plus the isothermal system installed on the press and the die cooling system, the productivity of the line jumps to higher levels guaranteeing the highest levels of mechanical properties that the automotive market request. The new “welcome”, which speaks Australian, inaugurates Presezzi Extrusion Group penetration into the Australian Continent markets, and a complete “turn-key” 10” extrusion line for the facility of G JMAES in Brisbane will be our business card. The project as a whole involves a new 35 MN 10” Front loading press, delivered by Presezzi Extrusion, the 10" press is fitted with an handling system that take into consideration the maximum dimensions of the special products and alloys products to be produced with a maximum height of the profiles of 250 mm maximum width of 450mm and a maximum linear weight of 20 kg/meter. 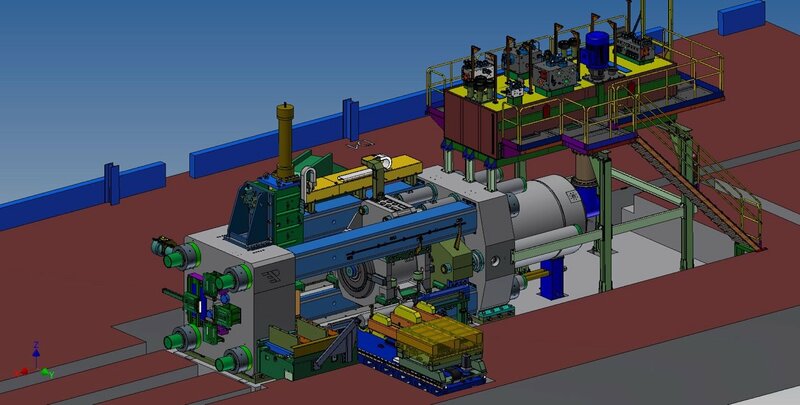 The new line will include the complete upstream equipment, including log vertical storages with 260 ton of capacity, brushing machine, 6 ton/h gas-fired billet heater with powered rolls, log hot saw with chips aspiration, Billet Conveyor to The Press. The customer will benefit from all the guaranteed added values COIM furnaces, such as the long guaranteed life of rolls and insulating parts, the low energy consumptions, the general high reliability of the equipment and the great accuracy of heating. The new Presezzi press is 35 MN front loading 10”, the press includes Presezzi’s patented PE.E.S. hydraulic system, that can give a 25% energy saving (depending on what is being produced), a nitrogen die cooling system; a shear to cut the profile between the die ring and bolster, avoiding manual cutting of the profile, and press mouth protection. The handling system after the Extrusion Press is equipped with hot-saw machine installed directly on the press platen (for the first extrusion) and High Efficiency Cooling System “HECS” with a Double Tandem Quench 2 x 7.5 meters long. The First Quench is composed by a Twins hood air and water 3.6 meters long and a Second quench composed by a Twins cooling hoods only air 3.6 meters long both equipped with high lowering speed in order to achieve the required cooling rates at the required maximum extrusion speed and minimize the scrap during the first extrusion. The cooling units willing in line can be operated together or separately (air or water) at highest or reduced power to reach the parameter cooling and the mechanical property request. The quench is equipped with “Optimization Software” HECS-OS, this innovative software automatically simulate and suggest to the operator the best cooling parameters (air or water) according the shape of profile. For additional cooling of the profiles, after the Double Tandem Quench, is foreseen an additional air cooling above and lower the lead out table made by nozzles. Above by means N° 4 Movable hoods and lower by means N° 3 cooling set on the total length in order to deliver the profile to the beginning of the run out table at 50°C. The system to handle the profile during the extrusion is made by means of a double puller lateral type with hot-saw machine (operator side), the proposed system allows to cut the extruded profiles on the die mark during the dead cycle time of the press. Each pullers can come near the press platen for the first extrusion (with the cooling hoods in open position) and take the profile directly from the fixed saw-machine on the press platen. For all the movement of the pullers and the hot-saw machine, as the main motors unit, the puller jaw rotation, jaw height adjust and IN/OUT of the jaws are foreseen by means of AC drives with frequency converter installed on board of the carriage. The handling table includes 5 sets of belts, an automatic sample saw installed at the beginning of the cooling belts and a 120 Tons stretcher for profiles till 52m. The stretcher can work either manually or with semi-automatic and automatic control with two men, one man and no man operations. The finishing saw is equipped with an automatic system for the removal of the head/tail pieces and the cut-to -length table allow a maximum length of the profiles of 16m. The operator at the saw, by means of movable belt at the exit of the cut-to-length table, can decide to reject the defective profiles in the lower scrap belt conveyor that feed a 150Tons scrap shear. By means of two underground belt conveyors, the scrap removal system is able to divide hard and soft alloys and drive them directly in the re-melt area. An automatic profile stacker for profiles till 16m load the profile into the extrusion baskets. The handling of the spacer bins is completely automatic. The basket handling system will also include all the ancillary machines and conveyors required to distribute the full and empty baskets all around the plant and prevent the need for any forklifts which could represent a safety hazard. A completely automatic overhead 3 axis bridge crane will be installed for loading of the two ageing ovens and an additional 2 axis cross-over crane with a 18 meter span in the main logistics centre, designed to transfer both long (made by 2 coupled single basket) and short full baskets to the various parts of the plant, the automatic storage or the packing lines, as well as returning empty baskets to the presses. The oven and loading rollers have been designed to allow the maximum use flexibility. In addition to the standard input-output doors a further door has been placed in the middle of the oven. The oven may be operated with this third door open or closed. With third door open the oven can be loaded with profiles up to 16000 mm long and an aluminium load up to 16 tons. With third door closed the oven works as two totally independent ovens. Each of these smaller ovens can be loaded with profiles up to 8000 mm long and an aluminium load up to 8 tons. Each oven can be programmed with its own heating cycle and loaded and unloaded independently. To achieve this goal the flow of heating air has been modified if compared with traditional double length ageing ovens. Instead of two fans placed at one end of the oven, a number of smaller fans has been placed along one side of the oven, each with its own burner and radiating pipe. Dedicated air ducts allow the radial circulation of heating air. Radial circulation of air warrants a more uniform heating of aluminium profiles during the heating ramp if compared with traditional double length ageing ovens. 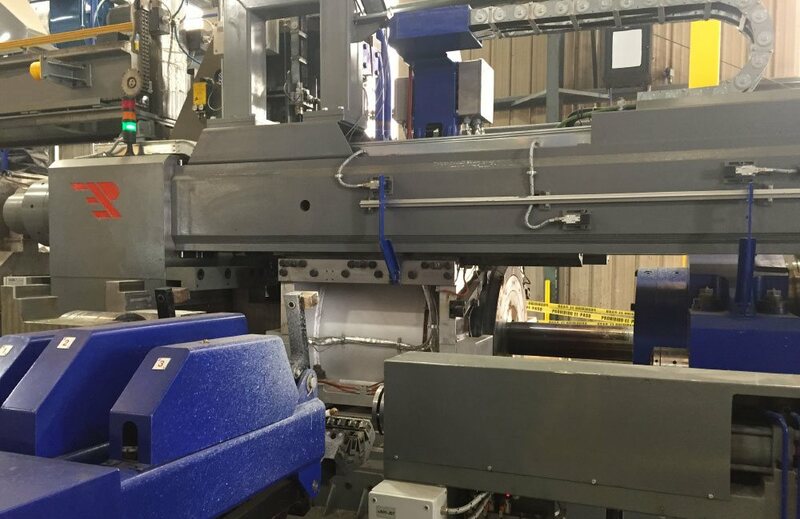 The scope of supply G-James has ordered will include the automatic die storage system with 9000 dies ranging in diameter from 261mm to 600mm and also including all the conveyors to transfer the dies in the die workshop and at the cleaning area. An innovative die hoist is designed to transfer dies automatically from the die oven area assembly / storage area to the die oven zone for subsequent loading into the press. The same monorail will also be able to transfer dies automatically from the die storage area assembly / storage area to the die oven zone. The manipulator can be equipped with an additional tools for the lifting of the dies. In this configuration can be used in manual mode and move the die from the die tilting to the assembly machines. At the end of the assembly process the manipulator can lift the die-stack and can be switch in automatic mode. Presezzi extrusion Group does not only create high performance and reliable equipment but can also supply any specific complementary tools to use with this machinery such as Data Manager. Data Manager Suite (DMS) is a complete, powerful and flexible software system, born from the twenty years expertise of Presezzi Extrusion, developed by the synergy of technicians expert in programming software engineering. Since the whole group is able to provide complete extrusion lines, it is increasingly necessary to have a system of management and supervision that is able to manage all the machines involved in the extrusion process on a single and easy to use data platform. The new DMS is a technological product designed for our most demanding customers, who are asking to increase productivity, reduce scrap and simplify the work of operators. Especially for the Australian leading company G-James Glass & Aluminium, which is continuously involved in the production of a diverse range of products, the DMS becomes a key point to be a company always in the forefront, providing products of ever-higher quality while reducing manufacturing costs. 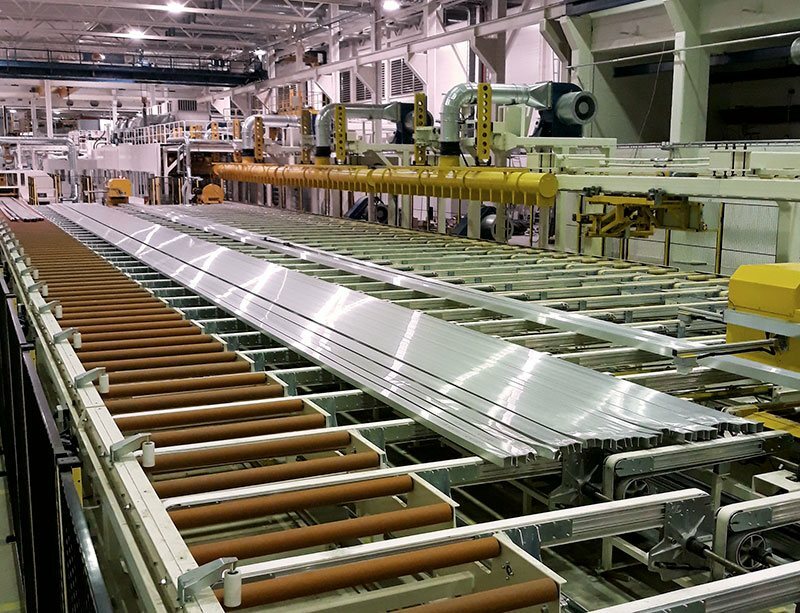 G-James extrusion’s plant, unique in its kind, has one of the highest levels of automation and a management tool become indispensable for the optimization of the production process. 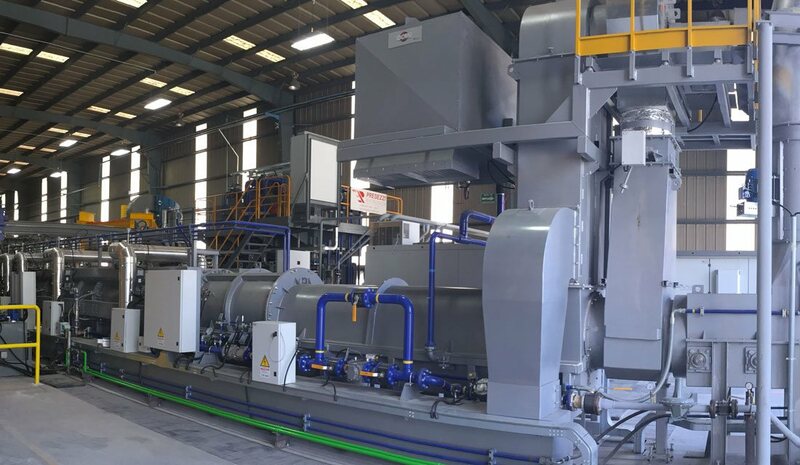 The whole plant includes: die heaters and automatic plier, logs storage and heating area, extrusion press, handling table with high efficiency cooling, ageing ovens, basket recirculation and cranes, dies shop and storage, quality control area, and Integration of other existing machines. Extensive work had been carried out on the project over several years by both the project teams at PE as well as at G-JAMES and had involved numerous meetings and workshops to ensure that all the latest technology and innovation were forefront in order to limit any oversights in the implementation phase. G-JAMES also involved several highly qualified engineers and managers on the project team in order to ensure that the knowledge acquired over many years of experience in a highly competitive and technologically advanced market would be put to good use in ensuring that any investments made would be in the highest level of technology available in the industry. 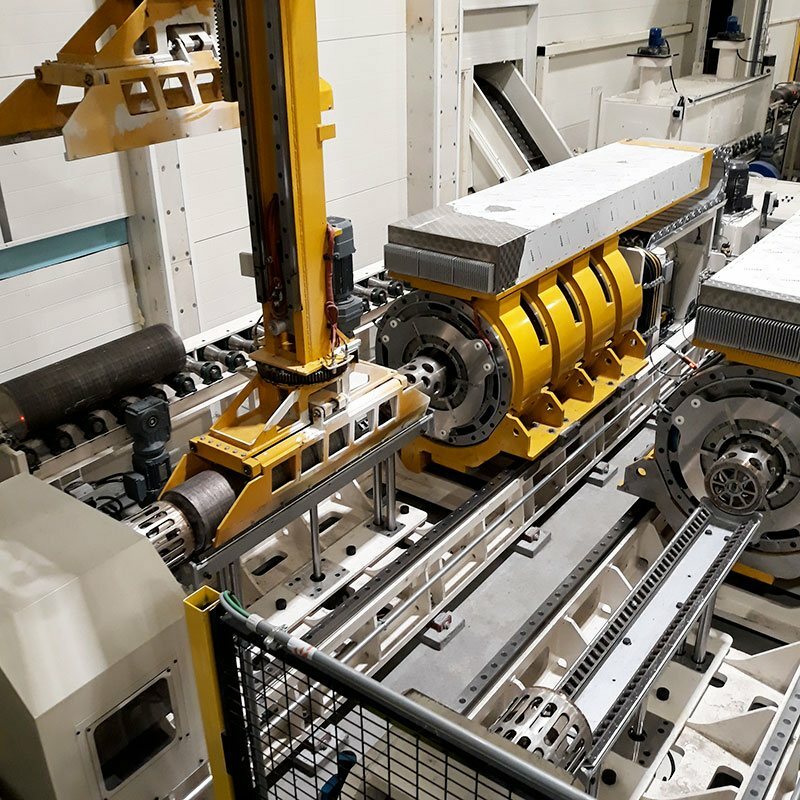 BENTELER Automotive division awarded Presezzi Extrusion Group with the contract for the supply of a complete extrusion line with a 55 MN 11" Front loading press. The investment will provide the company a new state-of-the art extrusion line with the best performances in terms of energy saving and extrusion quality, dedicated to serve the growing demand for aluminum extrusion in the automotive industry. 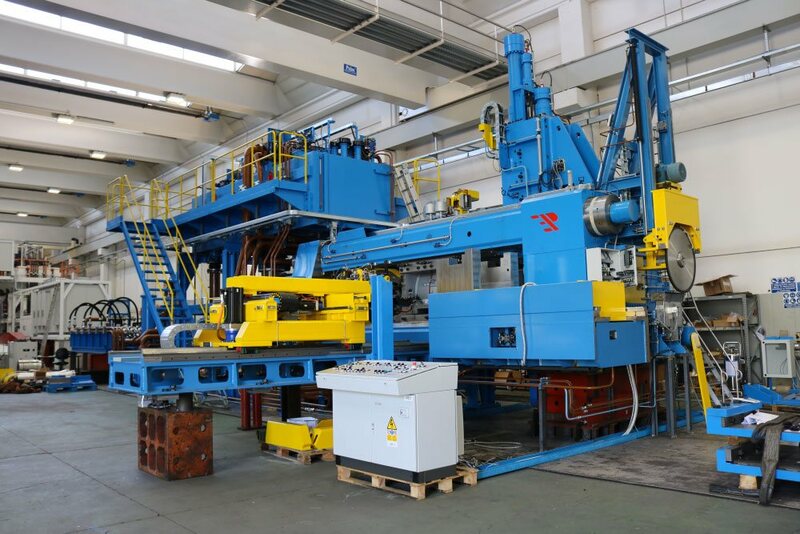 BENTELER, especially thanks to the innovative solutions presented by Presezzi Extrusion Group, has chosen to invest in a plant not only for consistency and competitiveness in terms of production but also for its cost-effectiveness and environmentally friendly reasons/aspects. The cornerstone of continuous innovation, focused not only on performance but also on energy savings, has allowed the Presezzi Extrusion Group to convince THE top player like BENTELER. In fact, thanks to the new billet heating (with) magnetic furnace ZPE (Zero Pollution Energy) and newly established PE.E.S.S. 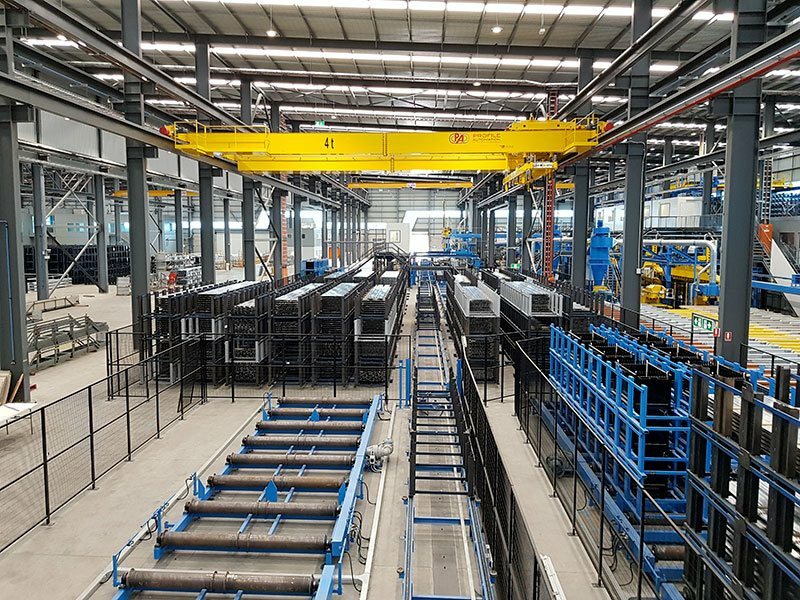 (Energy Saving System) technology for the press, several highly qualified engineers and managers from the BENTELER project team have chosen the PE Group. The new line will include the complete upstream equipment for logs and pre-cut billets, including log vertical storages, washing machine, Double ZPE billet heater, log cold saw with chips aspiration and Billet Conveyor to The Press. The new Presezzi patented ZPE magnetic billet heater can save up to 40% energy compare to higher level induction ovens in the market and allow to produce high accuracy profiles and dramatically reduce pollution. The new Presezzi press is a 55 MN front loading 11”, the press includes Presezzi’s patented PE.E.S.S. hydraulic system, and can give a 25% energy saving (depending on what is being produced), a nitrogen die cooling system; a shear to cut the profile between the die ring and bolster, avoiding manual cutting of the profile, and press mouth protection. The handling system after the Extrusion Press is equipped with High Efficiency Cooling System “HECS” with a Double Tandem Quench and “Optimization Software” HECS-OS that automatically simulate and suggest the best cooling parameters (air or water) according to the shape of profile. After the Double Tandem Quench, an additional adjustable air cooling above and lower the lead out table made by nozzles is foreseen. The handling of the profile during extrusion is made by a double puller OF lateral type with hot-saw machine which is completely electrical. The handling table with a 150Tons automatic stretcher move the profiles on A double finishing saw. The movable belt at the exit of the cut-to-length table, the rejected profiles can be conveyed to a lower scrap belt that feed a 150Tons scrap shear. The short profiles are piled UP by an automatic robot on the pallets. An automatic packing line will also strap and unload all the pallets. The long profiles will be automatically stacked and the handling of spacer bins is completely automatic. The handling of dies includes an automatic die storage system and an automatic die hoist designed to transfer dies from the die storage to the assembly machine, the die ovens till the press and vice versa. Since the whole group is able to provide complete extrusion lines, it is increasingly necessary to have a system of management and supervision like Data Manager Suite that is able to manage all the machines involved in the extrusion process on a single and easy to use data platform. The new Data Manager Suite is also included in the supply in order to manage the complete extrusion lines with a technological product that increase productivity, reduce scrap and simplify the work of operators.